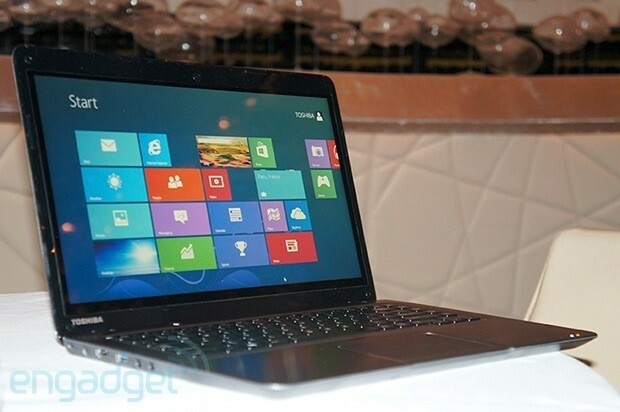 CES 2013 will be happening very soon but we don’t have to wait for the show to start to see what we can look forward to for 2013, Toshiba recently unveiled its budget Ultrabook, the Satellite U845t, a sub-USD$800 14” Windows 8 Ultrabook with touch. On the outside, the U845t packs a 14” 1366 x 768 touch display. It comes with one USB 3.0 and two USB 2.0 ports while a HDMI, Ethernet and an SD card slot surround the rest of the Ultrabook. Measuring at less than 2.1cm thin, the budget Ultrabook from Toshiba weighs roughly about 1.8kg and while it may not be the thinnest and lightest Ultrabook out there, it does pack some pretty good specs on the inside – a Core i3 or i5 processor, up to 6GB of RAM and 500GB HDD with 32GB SSD memory. More pictures available over at our source links.